Over the 2010 construction season, AquaBlok supplied a range of materials to remediate sediments at numerous historic Manufactured Gas Plant (MGP) sites. Materials included application of organoclay-based in-situ treament materials and the implementation of a second full-scale horizontal funnel & gate type approach. AquaBlok supplied materials to remediate sediments at five Manufactured Gas Plant Sites"
AquaBlok, Ltd., a manufacturer of innovative composite particle materials, and recognized as providers of a low-permeability thin cap sequestering technology, is pleased to report numerous successful applications of a range of in-situ treatment materials at historic Manufactured Gas Plant (MGP) sites during 2010. Over the 2010 construction season, AquaBlok supplied a range of materials to remediate sediments at five (5) MGP sites and one additional petroleum contaminated site that was not an MGP site. Materials included application of organoclay-based in-situ treatment materials and the implementation of a second full-scale horizontal funnel & gate type approach. One significant challenge at these sites involves implementing an approach to minimize the appearance of sheens on the water from residual seepage from the shoreline "wedge". The wedge is the triangular area of the site that slopes from the shoreline (generally the previously remediated up-land area) down to the sediment (below water level). 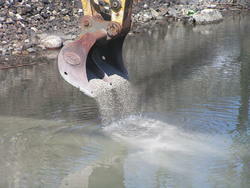 Consultants and site owners recognize the ability to uniformly and cost effectively deliver treatment materials to contaminated sediments provides an important alternative to the industry's historic "default" solution of dredging or excavation of sediments for ex-situ treatment/upland disposal. Material was supplied for installations Maine, New York, Indiana and Massachusetts. A solution to the shoreline "Wedge" was implemented at a MGP site in up-state New York was a Horizontal Funnel & Gate type of configuration of a combined in-situ treatment and capping approach. The key advantage of this approach is that it both removes residual contamination and reduces the potential for sheens which can be caused by isolated seep zones. AquaBlok, Ltd. is a manufacturer of composite (clay-based) materials utilizing its patented coating and delivery system. The company has a long history in the environmental industry and a range of products utilized in sediment remediation technologies. AquaBlok utilizes its delivery system in a range of other products including, pond and industrial impoundment sealing, as seep collars on piping, to construct cut-off walls in porous soil conditions, flood control applications (i.e. levee and dam protection), and to deliver organoclay-based materials. In addition, AquaBlok is a licensee of Halliburton's Bariod Division for the Baraclear® product.